A 27 year old male presents to his doctor with symptoms of nasal discharge. nasal congestion and headache which all started about a week ago. He mentions being in a healthy state before these symptoms started and has no significant past history except getting frequent upper respiratory infections which usually resolve on conservative management. He took acetaminophen but is still not getting better. URIs are among the leading cause of lost of time from work and school. It is difficult to distinguish URIs caused by virus or bacteria since the signs and symptoms are almost the same. Non specific URIs also known as "the common cold" have no prominent localizing features and usually present with nasal discharge, nasal congestion, cough and sore throat. In more severe cases patients may suffer from hoarseness, fever, malaise and body ache. The average duration of symptoms is about 1 week. Etiology of URIs: A wide variety of viruses e.g rhinoviruses, coronaviruses, parainfluenza, influenza virus and adenoviruses can cause non specific URIs. Secondary bacterial infections may complicate a few cases and may lead to prolonged course of disease with more severity of symptoms like purulent nasal and throat discharge. Treatment: Symptom based treatment like decongestants, antipyretics and anti inflammatory drugs are all that is required along with conservative measures like warm fluids, saline water gargles, etc. Sinus Infections: Infection and inflammation of the sinuses known as Sinusitis is a common reason for visits to primary care physicians. it most commonly involves the maxillary sinus, followed by the ethmoid, frontal and sphenoidal sinus. Sinusitis is defined as Acute sinusitis if the duration of symptoms are less than 4 weeks. Infectious and non infectious causes lead to sinus ostial obstruction and retention of mucus. Infectious causes include viruses ( rhinovirus, parainfluenza virus, influenza virus) and bacteria ( Strep.pnumoniae, Hemophillus influenzae, Moraxella catarrhalis). in immunocompromised patients fungal infections can also occur. Non infectious causes include allergic rhinitis, barotrauma and exposure to chemical irritants. Clinical signs and symptoms include nasal drainage and congestion, facial pain or pressure and headache. Toothache and bad breath may be associated with bacterial sinus infection. 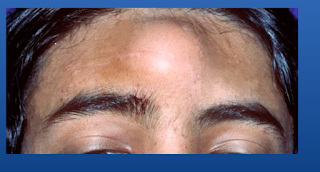 Advanced frontal sinusitis can present as " Pott's puffy tumor" : swelling and pitting edema over the frontal bone from a communicating sub periosteal abscess. Life threatening complications include meningitis, epidural abscess and brain abscess. It is difficult to distinguish viral sinusitis from bacterial sinusitis but the viral cases outnumber the bacterial causes. If fungal sinusitis is a consideration the involved area should be biopsied. Sinus Ct or radiography is not recommended for acute sinusitis except in nosocomial cases where it should be confirmed by sinus CT , with sinus aspirates sent for culture and susceptibility testing. Most patients improve without antibiotic therapy. For patients with mild to moderate symptoms treatment should focus on symptom relief and facilitation of sinus drainage e.g using oral and topical decongestants, nasal saline lavage. Antibiotics should be given only to patients with severe disease at presentation or those who show no improvement after 10 days. Surgery is considered in patients with intracranial complications or invasive fungal sinusitis. Antibiotics should only be given in acute sinusitis when patient have moderate symptoms of purulent nasal congestion or cough for more than 10 days or patient presents with severe symptoms of any duration that includes focal facial swelling or tooth pain. Sinusitis is defined as Chronic sinusitis iof duration of symptoms are more than 12 weeks. It is commonly associated with bacterial or fungal infection. Impaired mucociliary clearance leads to repeated infections. Fungal infections usually seen in immunocompromised patients which may lead to bone erosion and serious complications.